Photograph courtesy Roger Geach. 25207 & 25155 at Moorswater on Sunday June 11th 1978. They are headed for St Blazey depot after working a permanent way train to Tavistock Junction. The nineteen year four month career of D7557/25207 was split between London Midland & Western Region depots, with the bulk of the time at the London Midland depots. Time between last Classified repair and withdrawal: 71 months. October 1971 to Preston Division (D10). 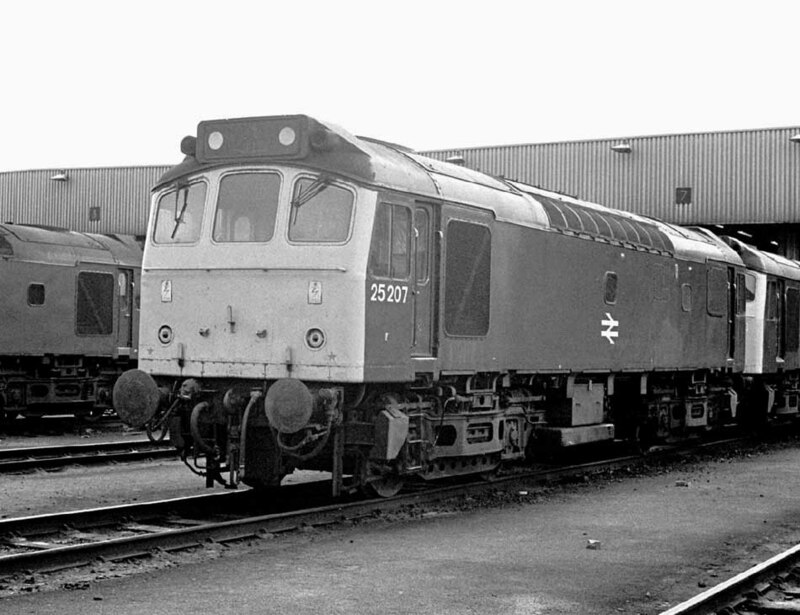 25207 was the 225th Class 25 withdrawn, one of six retired during November 1984. After withdrawal 25207 was stored at Toton until moved to Swindon Works February 21st - 25th 1985 (detail of moves below). The Works closed before 25207 could be scrapped, it moved to Cocklebury Yard on June 3rd 1987, Leicester Humberstone Road June 4th and into Vic Berry's yard on June 5th 1987. The locomotive became part of the stack until removed during the third week of February 1988, and scrapped by the second week of March 1988. 25161/193, 25207 Toton – Gloucester – Swindon Works February 21st-25th 1985. 25161, 25207/208, 25327 Cocklebury Yard – Vic Berry, Leicester June 4th - 5th, 1987. Photograph collection of webmaster. 25207 and eleven others await final movement from Swindon Works/Cocklebury Yard to Vic Berry, Leicester during June 1987. Noted Derby Works February & March 1974 (dual brake equipment fitted & painted from green to blue livery). Noted Derby Works April 1977. Noted Derby Works November & December 1978 (Classified). An early passenger working for D7557 was a Derby - Matlock service on August 26th. On September 11th 7557 & 5231 worked a Leicester - Ipswich football special, presumed throughout & seen at Norwich. On September 16th 7557 worked the morning Carlton Sidings/Manvers Main - West Drayton, a working booked for a Class 47. At noon on February 27th 7557 (livery two-tone green with full yellow ends) & 5180 were noted at Exeter stabling point having recently arrived with the Earles cement working. 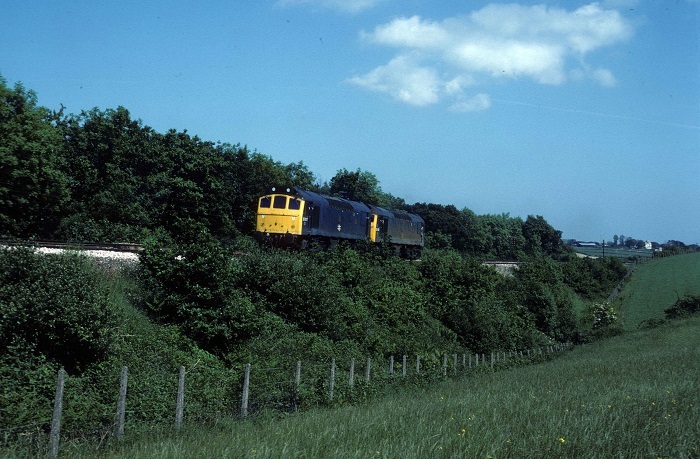 During May pairs of Class 25’s substituted for Class 45’s on coal trains destined for the Kent area with 7557 & 5187 noted on May 17th working a Brent - Southfleet service and the return Betteshanger - Toton. Two Skegness roundtrips have so far been recorded for 1973, from Leicester on June 17th with 5279 and from Derby on July 1st with 5233. On June 30th this same pair were noted on the Derby - Nottingham line with the Etches Park maroon set of coaches. 1974 produced a Nottingham - Llandudno Town roundtrip on June 1st. On July 19th 25207 & 25099 worked the full Derby - Norwich - Yarmouth - Norwich - Walsall diagram. Three Nottingham - Llandudno Town roundtrips followed, on July 26th, August 2nd and August 9th. 1976 produced a full Derby - Norwich - Yarmouth - Norwich - Walsall diagram with 25207 & 25136 on September 4th. The seaside visits continued, on June 18th with 25207 & 25117 on the full Derby - Norwich - Yarmouth - Norwich - Walsall diagram. The next day (19th) the same pair handled a roundtrip Derby - Skegness turn. On February 3rd 25207 worked a ‘hospital’ train from Carlisle to Crewe Works comprising 40137/143/150. During March 25207 was transferred to Laira, to spend two and a half years in the West Country. On March 29th 25206 & 25207 were marshalled at each end of a china clay train for the journey from Newquay to St Blazey yard. On August 2nd 25207 was noted hauling a three-car Swindon unit, noted at Perranwell & Truro. On June 28th 25207 worked the 16.40 Plymouth - Paignton. The 16.08 Exeter St. Davids - Barnstaple was worked on October 6th. The 09.48 Paddington - Barnstaple and 14.45 Barnstaple - Paddington were worked by 25207 on September 20th between Exeter & Barnstaple. 25207's last transfer was to Bescot during October. 25207 worked the Banbury pick-up job on October 10th. Two passenger workings were recorded during 1981 on the Cambrian line. On June 6th 25207 & 25202 worked the 10.10 Euston - Aberystwyth from Birmingham New Street, returning with the 18.00 Aberystwyth - Wolverhampton. The same diagram was handled on July 4th but with 25188. New freight contracts out of Heysham brought a considerable influx of Class 25s to the area, working the South Leith – Heysham coated gas pipes and return empties. The first train ran on September 29th behind 25262 & 25285, with the contract expected to last into the New Year (1982). During October 25201 & 25207 were regular performers on this working. 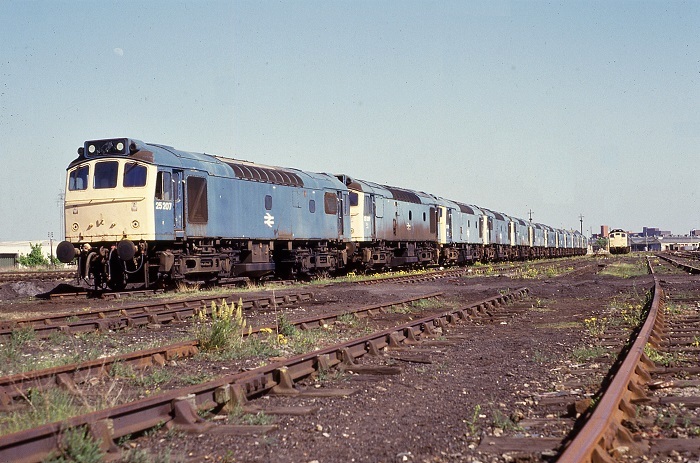 On November 22nd 25207 was noted at Coventry on permanent way duties with five other Class 25s whilst on November 27th 25207 & 25213 worked the Leith - Heysham pipes. 1982 produced some great variety. The failure of 45130 prior to working the 18.01 St. Pancras - Leeds on January 9th saw 25207 & 25321 work throughout. During February 25207 received an 'E' examination at Tyseley. On April 20th the 07.51 Lincoln St. Marks - Birmingham New Street diesel multiple unit required assistance at least from Nuneaton, possibly Leicester. Photograph courtesy Tony Sayer. 25207 had spent some time allocated to Toton in the early 1970's. 25207 is seen here at Toton on May 22nd 1982. The 10.39 Carlisle - Newcastle on July 23rd required assistance throughout following the failure of the diesel multiple unit. A run over the Cambrian line took place on August 14th with 25207 & 25190 working the 07.40 Euston - Aberystwyth from Wolverhampton and the 14.00 Aberystwyth - Shrewsbury. On January 1st 45108 had been diagrammed to work the 15.55 Leeds - Carlisle, but was instead utilised at short notice for another service. 25207 deputised and also returned with the 16.00 Leeds - Carlisle, was it a chilly day? On March 2nd 25207 was an unusual choice for merry-go-round empties in the Huddersfield area, normally the fixture for Knottingley’s Class 47/3’s. On the evening of May 21st Class 40 No. 40069 was noted assisting a failed 25207 and its load of ICI hoppers out of the loop at Altrincham, headed for Northwich. On July 23rd 1984 25207 & 40044 were noted on the BOC tanks passing Manchester Victoria. The other two recorded passenger workings during 1983 were also in winter, on November 8th 25207 worked the 07.48 Leicester - Leeds to Nottingham and on December 1st 25207 assisted the 10.38 Stranraer Harbour - Euston between Lancaster & Preston due to a power failure. 1984 was the last year in service for 25207, with its first passenger working of the year being on January 14th working the 17.42 St. Pancras - Liverpool to Nuneaton (comprised of Mk III stock), the diversion caused by a derailment in the Euston area. Class 25s filling in for pairs of Class 37’s on the morning Earles Sidings – Widnes cement included 25207 & 25230 on April 9th. On April 19th the 18.20 Glasgow Central - Manchester Victoria was worked forward from Preston by 25207. More assistance was provided on May 13th when the 07.15 Euston - Holyhead charter was dragged between Northampton & Coventry by 25207 & 25072, the power being off for engineering work. On June 2nd 25207 & 25042 worked the 10.10 Euston - Aberystwyth from Wolverhampton and the 17.05 Aberystwyth - Shrewsbury. 25207 & 25076 were noted on July 12th's 6V32 1456 Ellesmere Port - Severn Tunnel Junction freight. On July 23rd the eastbound BOC tank train was noted at Manchester Victoria behind 25207 & 40044. 25207 was north of the border on July 31st working the 07.25 Glasgow Central - Carlisle. The 23.00 Manchester Victoria - Blackpool North on August 10th was worked throughout by 25207. Photograph courtesy Phillip Moore. 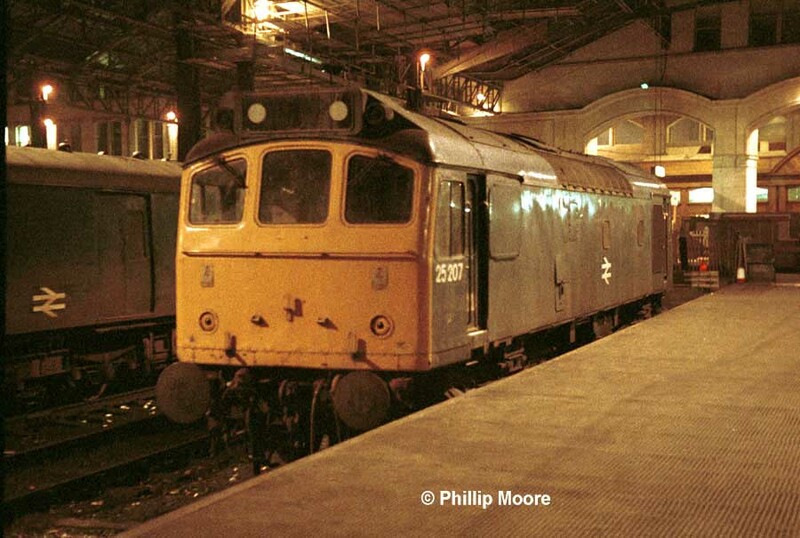 25207 slumbers under the Victorian metalwork of Manchester Victoria on September 24th 1984. With less than two months of revenue earning service left, 25207 will eventually become just so much scrap in Vic Berry's yard. And finally on October 24th 25207 & 25205 worked the 19.00 Manchester Piccadilly - Cardiff forward from Crewe, a relief parcels train with passenger accommodation? 25207 was withdrawn on November 12th 1984. Page added July 13th 2013.